Our Mission: We perceive Christ calling us to: Walk together in God’s love; nurturing faith, doing justice, serving all. We are a community of people seeking to grow in our relationship to God, to others, and within our own selves. If you are new to Christianity or have been away from the church for some time, know that we come from a variety of religious backgrounds and experiences. Some of us were raised Lutheran, but many of us found our way to First Lutheran in other ways. Here you will find people who have been shaped in Roman Catholic, Methodist, Episcopal, Quaker, and other communities of faith, as well as people who have had little or no prior church experience. What binds us together is the gift of God’s unconditional love and forgiveness made known in the person of Jesus Christ. We believe that again and again God comes down and welcomes us home, restores us, forgives our past, and empowers us for life now, before we do anything. There’s mystery and joy in this, a mystery and joy that we experience in our worship and communal life together. We believe it is our call to welcome and love others as Christ welcomes and loves us. Many of our active members have come in the last decade, so we know what it is like to be new to a community. Many of us have moved to the Boston area from elsewhere in the US and abroad. For many of us, our extended family lives far, and the nurturing of our relationships here in community matter greatly. We are married and single, old and young, gay and straight; and in our ever more polarized society, there’s even a mix of political view points. Our active members live in 15 different towns and cities from Waltham to Lowell, to Hopkinton to Boston, and in between. We take into account long commutes and put a strong emphasis on our time together on Sunday mornings. You are welcome here. Rev. 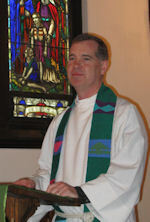 Thomas Maehl has been pastor at First Lutheran since 1999. Pastor Maehl earned his Masters of Divinity from the Lutheran Theological Seminary at Philadelphia. Ms. Cynthia Niiler has been the Director of Music at First Lutheran since 1996 and has been the Parish Secretary since 2000. She earned her Masters of Sacred Music with a choral concentration from Luther Seminary (with St. Olaf College) in St. Paul, MN. Vicar Athena Bless is a graduate of Wake Forest School of Divinity and is completing her seminary education through Pacific Lutheran Theological Seminary in Berkeley, CA.